Paul Azinger has been named as US Ryder Cup captain for the next match against Europe at Valhalla, Kentucky, in 2008. The 46-year-old former cancer sufferer is a veteran of four Ryder Cups - winning in 1991 and 1993 - and got the nod over Fred Couples and Corey Pavin. Azinger faces a tough task after the USA's third straight defeat, and second by a record 18½-9½, in September. Europe have already chosen record points scorer Nick Faldo as their captain for the event. "It's the greatest honour you can bestow on a professional golfer," said Azinger, who has also been instrumental in changing the process by which the US team is selected. He will now be able to pick four rather than two wildcard players, while qualification points will no longer be awarded only for top-10 finishes. PGA president Roger Warren said: "[Azinger] demonstrated a clear and consistent passion and excitement for the Ryder Cup, and that passion and excitement will excite his players. It will motivate them. "He is going to lead this team at Valhalla and begin the resurgence of the American Ryder Cup, and we're going to win it here in Valhalla under Paul Azinger." Azinger, who takes over as skipper from Tom Lehman, played in the Ryder Cup from 1989-1993 and 2002. He was unbeaten in his four singles matches, winning two and halving two, and ended his Ryder Cup playing career with an overall record of played 15, won five, lost seven, halved three. Azinger was a feisty competitor in his prime, and had a number of brushes with Faldo and Seve Ballesteros. The American debutant first met the Spanish legend in an acrimonious singles match at The Belfry in 1989, which Azinger won following a controversial drop after a shot into the water on 18. Their paths crossed again in a bad-tempered foursomes match at Kiawah Island in 1991, which prompted Ballesteros to claim the Americans were "eleven nice guys and Paul Azinger". The American hit back, labelling Ballesteros "the king of gamesmanship". 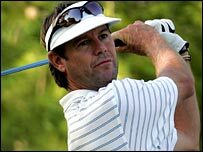 Azinger also had the audacity to escape with a half against Faldo in 1993 despite the Englishman's hole-in-one. For Azinger it was a moral victory and revenge after Faldo pipped him to the Open title by one stroke at Muirfield in 1987. Azinger went on to claim the USPGA title in 1993 - a year which also saw him diagnosed with cancer in his shoulder. But a successful fightback culminated in his most recent Tour victory at the 2000 Hawaiian Open. 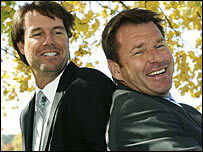 In recent seasons, Azinger has also worked alongside six-time major winner Faldo as a TV commentator. "I think it's very good for both of us," said Faldo. "We've been able to build up a bit of a relationship over the last couple of years. "I'm sure we will have our moments as Ryder Cup captains because we are both hotheads and we're going to have to lock horns over some issues to protect our teams. "But I'm sure, in the big picture of the Ryder Cup, we will bring to it a bit of fun and a bit of entertainment as well. "And why not? Clearly it's a very serious event and we all know what our goals are. But it's equally important that everybody has a great experience from being a Ryder Cup player." Faldo added: "It won't be easy and playing America at Valhalla, the home of the American PGA, I'm sure they will be gunning for our boys. "But I'm confident my team will have very much the backbone of this last team and obviously I want the guys to be as dominant as they were this time."